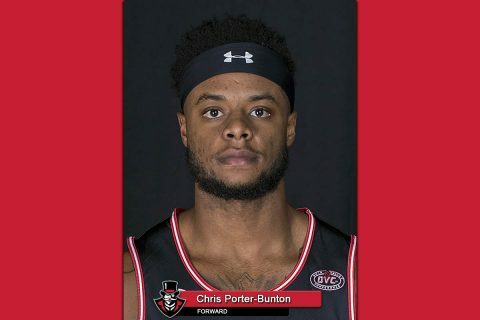 Nashville, TN – Austin Peay State University (APSU) senior men’s basketball player Chris Porter-Bunton has been Tennessee Sports Writers Association Men’s Basketball Player of the Week after leading the Govs to a pair of road victories in Alabama. The Bowling Green, KY, native averaged 16.0 points and 9.5 rebounds for the Govs against Troy and Alabama A&M, hitting 60.0 percent (12-of-20) from the floor—including a perfect 6-of-6 night Saturday against the Bulldogs. Austin Peay’s first true non-conference road win since 2015. He also scored 16 points against Alabama A&M. This is Porter-Bunton’s first career honor from the TSWA; he’s the first Gov to earn TSWA honors since Averyl Ugba for the week of Jan. 2, 2018 and just the fifth since 2013.